« Judy Chicago is 75! The World Needs More Ned O’Gormans!!! 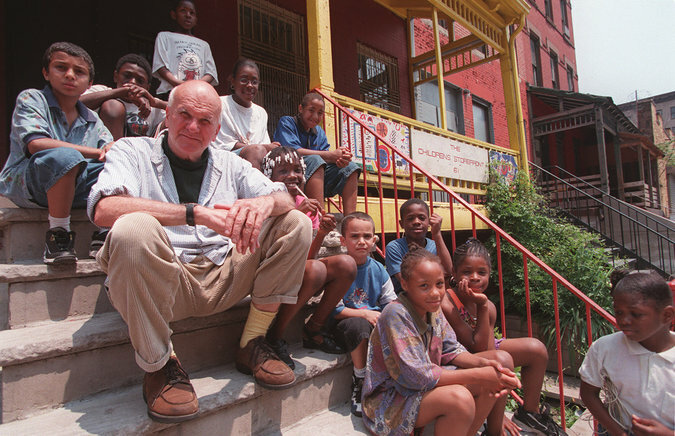 Ned O’Gorman, an award-winning poet who gained his widest attention for starting a storefront school in Harlem — a “liberation camp,” he called it — to bring literature, Latin and love to disadvantaged children, died on Friday at his home in Manhattan. He was 84. The cause was pancreatic cancer, his sister, Patricia O’Gorman Schonfeld, said. The school, the Children’s Storefront, has flourished in three adjoining townhouses on East 129th Street, becoming a fully accredited, tuition-free school with a $4 million budget and a student body of about 170 children, from prekindergarten through eighth grade. Mr. O’Gorman’s story began as a struggle for identity in a wealthy but troubled family that had ties to French royalty. Edward Charles O’Gorman was born in Manhattan on Sept. 26, 1929, to Annette de Bouthillier-Chavigny and Samuel Franklin Engs O’Gorman. He grew up in Southport, Conn., and Bradford, Vt. By his account, the family lived on inherited money in a high-society whirl, at least until the pile of money had been slowly frittered away. Many years later, he wrote that he had felt neglected by everyone but his nanny and had lived in a world of imaginary friends. He graduated from St. Michael’s College in Vermont and earned a master’s degree from Columbia, where the poet Mark Van Doren, one of his teachers, praised his poems. He had begun to develop a distinctive, passionate literary voice ripe with exuberant metaphor and concerned with social justice. He said that after a trip to Europe, where he stayed in an Austrian monastery, he decided to be a priest but was twice rejected — by the rector at St. Joseph’s Seminary in Dunwoodie, N.Y., who told him he regarded poets as unstable, and by a Benedictine monastery after a psychological test. Mr. O’Gorman believed that the abbot suspected that he was gay. In his early years Mr. O’Gorman, a tall man with a longshoreman’s build, lived in Greenwich Village, where he was active in Dorothy Day’s Catholic Worker Movement. (In later years he lived in relative luxury near Lincoln Center and the ballet and opera that his mother had taught him to love.) In 1965, the State Department employed him to teach American studies in Chile, Argentina and Brazil. By the mid-1960s, Mr. O’Gorman was literary editor of the Roman Catholic magazine Jubilee. He corresponded with intellectual luminaries like Susan Sontag and Thomas Merton and later collected their thoughts in the book “Prophetic Voices: Ideas and Words on Revolution” 1969). He was awarded two Guggenheim fellowships. Mr. O’Gorman collected donations, using his social connections, and two months later started a children’s library in the store, naming it after Addie Mae Collins, one of four black children killed in the 1963 bombing of a church in Birmingham, Ala. The library grew into a ragtag preschool for about 50 children. Mr. O’Gorman provided lunch from a hot plate, sometimes serving Dinty Moore canned stew with pineapple chunks. The enterprise reflected Mr. O’Gorman’s playful, rambunctious personality. His stated goal was the expansive one of reversing “the pervasive lack of imagination” in nurturing young minds, and he offered an eclectic program: French and Chinese lessons, classical music and Shakespeare, along with reading, writing and arithmetic. To Mr. O’Gorman, each child — or “angelic spirit,” in his phrase — demanded special treatment. One boy couldn’t speak a word at age 3, but he had perfect pitch, so teachers used music to teach him the rudiments of speech. “Ned was often the only person in their lives who believed in them,” said Elsie Vanderbilt Aidinoff, who taught at the school and was chairwoman of its board. In 1981, the preschool became an elementary school, starting with four kindergartners. Mr. O’Gorman helped graduates get into elite public high schools like the Bronx High School of Science and private ones like Dalton, but he was equally devoted to students with special needs. There were no admission standards. By the late 1990s, the school had acquired larger quarters on East 129th Street and was boasting college graduates; the first earned a degree from Haverford College in Pennsylvania in 1994. There were disappointments, though they were rare. One of the few students Mr. O’Gorman ever asked to leave the school was shot by police officers while trying to rob a store. In the 13-year-old’s pocket were 35 vials of crack. Mr. O’Gorman did not escape criticism from other quarters. After he urged in an article in The New York Times in 1975 that the government be more assertive in taking children away from abusive parents, readers wrote letters accusing him of elitism and of disrespecting Harlem families. Besides Ms. O’Gorman-Schonfeld, Mr. O’Gorman is survived by another sister, Annette Kamal. The same year Mr. O’Gorman retired from the Storefront, he started a new preschool, the Ricardo O’Gorman Garden and Center for Resources in the Humanities, on West 129th Street. The name was in memory of a son he had raised from diapers and adopted. Ricardo had died of AIDS two years earlier at 26. The school, informally known as the Garden, continues to thrive.